SoapBoxLA: CityWatchLA - Metro Goes Into Company Mode! Above the Law? CityWatchLA - Metro Goes Into Company Mode! Above the Law? A Metro bus operator on Sunset Blvd. pulls out from a bus stop and "asserts" himself into traffic, forcing the cyclist riding downhill in the bike lane to give up the bike lane. The cyclist is alongside the bus as they both merge left, the bus operator by choice, the cyclist with no choice. The cyclist bangs on the side of the bus and continues riding east on Sunset Blvd. Between Micheltorena and Silver Lake Blvd, the Metro's bus operator drives behind the cyclist, honking and waving his hand. The theatrics come to an end at Silver Lake Boulevard when the bus operator rear-ends the cyclist and yells, "You vandalized my bus!" With the bike stuck under the front bumper of the bus, the cyclist calls 911 while the bus operator pulls the bike out, explaining, "If it's not on the rack, it doesn't belong on the bus." He then throws the bike to the curb. The Los Angeles Police Department asks the cyclist if there are any injuries and if any emergency medical services are needed. 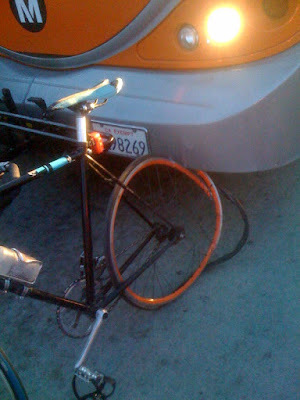 Upon learning that there are no injuries, the LAPD simply instructs the cyclist to exchange information with the bus operator and file a report. Meanwhile a Metro Supervisor shows up along with a Los Angeles County Sheriff's Deputy on a motorcycle. They take control of the situation, the bus operator no longer talks to the cyclist, and the Metro Supervisor, the Deputy and the Bus Operator all get on the empty bus. (Another bus had arrived and taken the passengers, leaving the empty bus and the bus operator behind) The Cyclist attempted to board the bus with the Deputy, the Supervisor and the Bus Operator but was denied access. He asked for the bus operator's information but was again denied. The Sheriff's Department works for the Metro and is responsible for the security of Metro property. The streets of Los Angeles are not the Metro's property. The Metro's Supervisor and the LASD are both there to protect the Metro, the Metro's property and the Metro's employee. Who is representing the cyclist? The question here is simple, "Is the Metro above the Law?" Is a Metro bus operator required to exchange information with the cyclist according to the California Vehicle Code or is a Metro bus operator allowed to disappear into the Metro's system, leaving the cyclist on the street with a 3" by 5" card in his hand and some Metro identification numbers along with instructions on how to file a Metro property claim? Is the Sheriff's Department authorized to overrule California Vehicle Code and interfere with the exchange of information between two parties involved in a traffic collision? The Metro has approximately 9200 employees, making it one of the region's largest employers. Of those who are engaged in providing the LA County area with a robust and comprehensive Transportation System, approximately 1540 take advantage of the Metro pass that is offered to employees but only 155 actually use the free pass to ride the Metro to work. Apparently, Metro employees ride the Metro less than the general public (Metro estimates that 7% of LA County uses public transportation but less than 2% of Metro employees share that ride) and they also ride bikes less than the general public. (Metro estimates that 2% of the general population rides a bike to work but at the Metro, it drops to 0.4% mode share) What happens when people go to work for the Metro? What is it about working for a regional Transportation Authority that motivates employees to get in a single occupant motor vehicle? Do they know something we don't? The cyclist involved in the Sunset Boulevard incident has a suggestion for the Metro: the Metro's bus operators should ride a bike on the same streets for a week. Then perhaps they'd develop some empathy for those who are smaller and more vulnerable. Who knows, they might like it and the Metro's AQMD compliance results might improve! I once had a Big Blue Bus driver attempt to make me move over by deliberately edging the bus towards my bike at a red light and yelling. The light turned green when the bus was just inches from my rear wheel. I leapfrog buses all along this strip of Sunset on my commute each day. Some Metro operators are very respectful, and some have caused downright life-threatening situations. To those that understand we are all sharing the road, I regularly thank them. And to those I have sought to inform of their less-than-desirable driving behavior, well, you would think that I had insulted their mother by the rash of profanities unleashed in my direction. I hope the cyclist includes in his/her formal complaint that the operator, supervisor, and Metro Police violated CVC 16025 by refusing to exchange information. Highly unlikely that the City Attorney or District Attorney will take any action here. It was almost a year ago that Metro promised to implement a bus operator training program aimed at educating bus drivers on their responsibility to share the road with cyclists. Apparently this is too big of a task for the largest transportation agency in the region. Will it take the death of a cyclist at the hands of an ignorant, malicious bus operator before Metro delivers on its promise? The % of transit ridership and bike to work numbers by Metro employees is shameful, especially since AQMD recommends Metro as a preferred consultant for providing employee transportation encouragement programs. If Metro can't even encourage its own employees, how can they be a preferred consultant? I wonder how LA Metro stacks up against other transit agencies? That pix makes it looks like an assault with a deadly weapon to me. Short answer: if the CA won't touch the case, than apparently they are. these LA streets are the meanest around .... get down or lay down !!! It just baffles my mind that a police officer sees that a bus has crushed a bike like this, and basically does nothing. If it was a car...need I say more. I just don't get it. When did I become a second class citizen? Why did my decision to ride a bike as a transport mode make me less than human or 3/4 of a person and not worthy of the protection that my taxes pay for? Many cyclists ride Metro. How can they treat their own customers this way? We should organize a protest as a Metro board meeting. Chain 100s of bikes around their cars so they can't get out until they listen. Yes, I know it's kidnapping but still. CityWatchLA - End of the Road for the LADOT! East Hollywood NC Frees the Street! Metro Bike Parking - Won't Get Fooled Again!